This retreat is dedicated to JOY and full expression of your truest self. 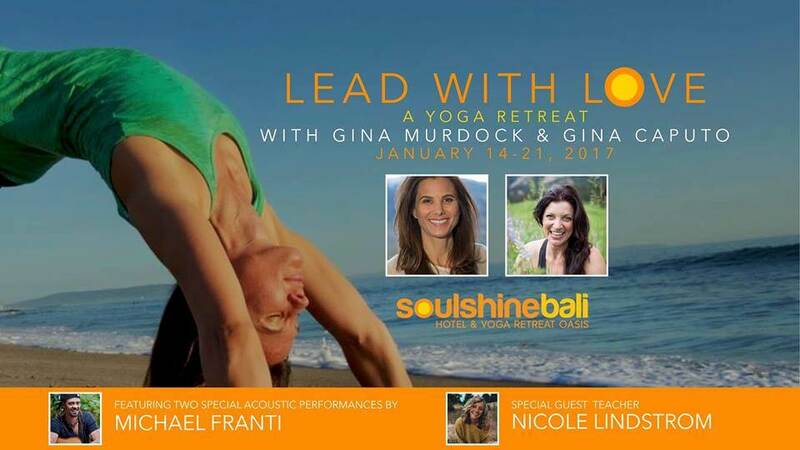 We will focus on how to more fully “Lead with Love” in all areas of life with teachers Gina Murdock + Gina Caputo! Gina Murdock is the Founder of Aspen City of Wellbeing and Aspen Yoga Society and a yoga and meditation teacher. Gina Caputo is the Director of the Colorado School of Yoga, an internationally respected yoga teacher known by her moniker, the Yogini On The Loose! Added bonus: Yoga and Meditation teacher Nicole Lindstrom will be on hand to help nurture this extraordinary experience! Two Gina’s = double the fun! Add in Nicole, some Michael Franti and the magic of Bali and … You will be transformed! You will enjoy twice daily yoga classes and mindfulness meditation, live music with *Michael Franti on day 1, lively discussions and cultural excursions diving in to the incredibly inspiring culture of Bali + free time to chill! The retreat will include a day at White Sands beach up in Padang Bali, a visit to the Pura Tirta Water temple where you will be able to move through the water and offer prayer and blessings. We will also visit Bumi Sehat Birthing Clinic, founded by Robin Lim 2011 CNN hero of the year. You will have an opportunity to bring any items for donation and learn about Robin's experience. We want you to have a full Bali experience and so we have also included an off-site cultural dinner where we can see traditional balinese living and taste authentic food.